Elk were valued by the early settlers and Native Americans as a valuable food source, hides and fur for clothing, and antlers for utensils and truphys. Today elk are economically valuable for hunting and tourism they bring to the mountains of the west. Elk were named by the early settlers, but some people prefer to call it by the Shawnee name wapiti (WAA-pi-tea) meaning “white rump.” The name "elk" is a bit confusing because in Europe, moose are called "elk." and the European "red deer" is the same as the north American elk, which muddies the watereven furthur. evidentilly the same nameing scheme that called for the american bison to be called a buffalo. At the turn of the century, commercial game hunters, hired riflemen and subsistence hunters had left few elk in the west. In 1910, the U.S. Forest Service estimated that fewer than 1,000 elk remained in Colorado. A 1918 survey of Forest Service lands in Idaho showed only 610 elk remained. Where elk had been protected, these prolific animals rebounded quickly . They were pounded by hard winters in 1897, 1909, 1911 and 1917 all coinsiding with the loss of their traditional wintering grounds to cattle ranching. About 10,000 elk starved in Jackson Hole during the winter of 1897, a decade before Jackson Hole became the home of the National Elk Refuge. 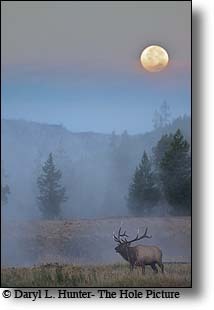 A bull ek at Madison Junction Meadow under a full moon at sunrise. At the turn of the century efforts to "bring back the elk" were started in a partnership between government and Hunters. One of the most ambitious of game transplanting projects began in when starting in 1892 Yellowstone over several decades 5,200 of the park's elk were shipped to 36 states as well as to Canada and Argentinain a transplantation effort to restore elk to many of their native areas. That effort and many since have paid off. From a total elk population of 41,000 in 1907, elk on U.S. ranges have now come to number nearly a million. Elk belong to a group of animals called ungulates, the Latin word for "hoof." All ungulates have hooves. Elk are second in size only to the moose in the deer family. At birth, an elk calf weighs about 35 pounds. At the start of its first winter, an elk may weigh five times as much as when it was born.The average weight of an adult male is 650 pounds, and some individuals attain weights of 1,100 pounds. Cows and calves mew to each other. Adult elk often bark when they sense an intruder just outside their "immediate threat" zone. Elk being herd animals have eyes are on the sides of the skull, this enables them to see what is happening ahead of them, beside them, as well as what is going on behind them. This is the reason they used to put blinders on horses (a herd animal) so they could only see where they were goingwithout the destractions of what was beside them and behind them. An elk's big ears can capture faint sounds and other sounds of movement. Elk also have a keen sense of smell. Combine the sharp senses of a group of five, 10, or even 50 elk and it's easy to understand how they avoid predators. Elk that live in mountainous country migrate to lower elevations as the winter snows drive them out otf the higher elevations. in the spring as the snow retreates the elk follow the snow line up the mountains because the higher elevations provide remoteness and less insects. Elk are social animals and during the summer they live in large herds. These herds are dominated by a single cow. In spring the bulls and cows separate and the females leave to calve, while bulls form their own separate herds for or small bachelor groups until fall. A Prancing Bull Elk ready to take on all challengers to defend his harem of cow elk in Grand Teton National Park..
Elk being herbivores eat only plants. Their diet includes grasses, forbs, shrubs and trees. being herd animals they must eat and watch for predatorseat and at the same time . An elk herd always has at least one animal looking up while the others are eating. Even so the animals that are feeding are always on the lookout for warning signs of predators. The males have antlers that can span five feet and have six sharp points or "tines." per side upon maturity but a few have as many as 10. The width bredth and weight of an elks rack is determined by the abundance of food as well as age, bull elk shed their antlers in late winter. Testosterone is the hormone in the bull's body controlling the "cement" that holds the antlers to his skull. In winter a bull's testosterone level drops and so do his antlers. Increasing daylight later In spring, elevates the level of testosterone in the animal's blood, which triggers the growth of antlers. The antlers grow from the bony bumps on their skulls called pedicles. Antlers are cartilage that slowly mineralize into bone. A soft covering called velvet carries blood to the growing bone tissue and helps protect the them. Antlers are fragile until they completely mineralize and harden in time for rutting season. September brings rutting season (mating season), bulls form harems of cows, which they defend with their seasonally aggressive nature, One bull may have a herd of fifteen to thirty cows, but some may have achieved a many as sixty. 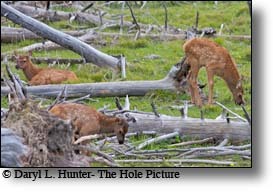 During the rutt, the bull elk engage in a fight for dominance, they bugle, they wallow in the mud holes they have cented with their urine, they urinate on plants that they toss onto their antlers. It is thought that this activity makes the bulls more fearsome to other bulls and more attractive to potential cows. Bull elk make a sound called a "bugle," a true sound of the wilderness that starts as a bellow, changes to a loud whistle, and ends in a series of grunts. The bugleing serves to challenge to other bulls and to attract the cow elk. 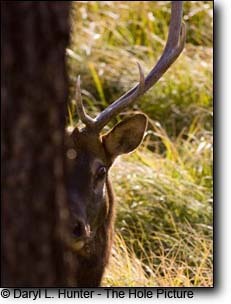 This timeless wilderness show can be seen in the meadows of Yellowstone and other places where there is no hunting pressure, where elk are hunted they are unaproachable and are often hiding in the trees. Elk don't make just one sound and what they communicate is still largely a mystery. The typical "Unh-ai-EEEE! yuh, yuh" has been called a challenge. But many bulls give voice when they have no intention of fighting. Some bugle a lot, others infrequently. Besides bugling, you'll hear chirps, grunts, gurgles and squeals.Bulls are only territorial during the mating season and are otherwise not aggressive toward other elk. 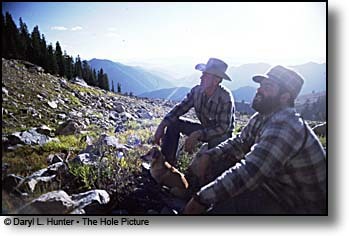 Outfitter Clark Wheeldon (left) planning next move of the hunt. Elk hunting in the Greater Yellowstone region can be one of the most remarkable experiencesof your lifetime. Here in the Greater Yellowstone region you will see either the splendor of the Grand Tetons, the Gros Ventre Mountains, the Woming Range, the Absoraka Range, Snake River Range, or the Big Hole's. Jackson Hole is also the home of the National Elk Refuge where 6 to 12 thousand elk spend their winter tawnting you into thinking that your hunt is going to be easy. 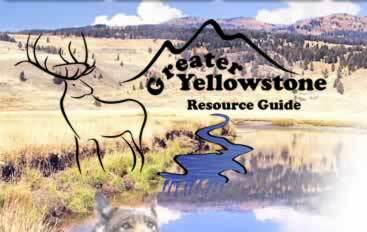 In the Greater Yellowstone area there are many outfitters and guides to choose from if you choose to not go without a guide. Any hunter planning an Elk hunt should sight his rifle for long range shooting, and practice till you have it right. 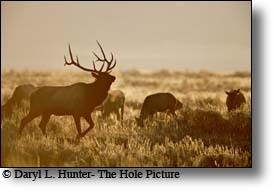 The most popular caliber rifle for elk hunting are the.30-06, 7mm mag , .300 mag, and the .338 magnum. recomended scopes are 2x7, 3x9, or even 4x14 power of the best quality that you can afford. Elk will evade hunters by hiding in the toughest country imaginable. When you are on your hunt is not the time to find out that you are not in shape. You will be hunting in elevations of up to Between 6,000 and 10,000 feet or more. Conditioning may not be the answer to hunting success but it will have a part in it. Exhaustion and fatigue can kill you in the mountains. It is important to remember that the air is thinner at higher elevations than it is at sea level and getting enough oxygen for some might be tough. Don't let you poor physical condition ruin your hunt. The elk, are not going to come to you.